Summary : A good but not overpowering jasmine green tea. I found the fragrance to be especially weak, but the flavor was solid but not as strong as I tend to like my jasmine green teas. Review : I suspect if I was to be exiled to the Alaskan tundra, and could only choose one tea to have for the rest of my life, it would be any tea that has jasmine in it. And right now, looking outside and seeing all the snow and the frigid temperatures, that is exactly how I feel...exiled to a place where winter is endless. And so, with winter seemingly light years away from ending, I was in the mood for something that said summer all over it. And what better "summer tea" than a jasmine green tea? After all, jasmine teas are scented with jasmine flowers, making the tea wonderfully aromatic and potent in flavor. And flowers are certainly a wonderful way to have hope that the warm weather will someday arrive. So, I dug through my tea samplers in a frantic search for a jasmine tea. And, after a few minutes, the first one to show itself was a jasmine green tea from Choice Organic Teas. 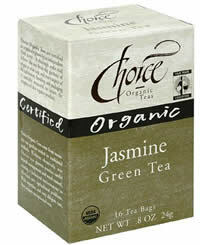 Here is how Choice Organic Teas describes this tea : "Produced only during August, when the jasmine flowers bloom. Freshly-picked wild blossoms are mixed with organic green tea, and removed after leaving their ethereal, floral scent behind." I'll confess right here. Jasmine teas are one of my favorite teas around. And I'm exceptionally picky about how they should taste and smell too, which in one word can be best described as I love them "strong." Jasmine teas are actually one of the few teas where I could probably be considred a "tea snob" in some ways. So, why the disclaimer? To put it simply, I found this tea a bit lacking but can see where other people might like it. Now, with that out of the way, let's talk about the tea. First off, I was VERY disappointed with the fragrance of the leaves. In virtually all other jasmine teas I've had, particularly jasmine green teas, the aroma of the leaves soon has your kitchen smelling like a lovely summer flower garden. With this tea, sadly, I really had to sniff to smell the jasmine fragrance. And what fragrance there was I found to be, well, weak, at least in comparison to other jasmine loose-leaf teas I've tried. Still, while disappointed by the teas fragrance, I've had more than a few teas disappoint me in the fragrance department but shine in terms of flavor. So, I poured water over the leaves and hoped for the best. What I found was a very good jasmine green tea but not exactly what I was hoping for. Make no mistake, if you were blindfolded you'd easily be able to identify this tea as a jasmine green tea. The jasmine flavor is indeed distinct. And, happily, the flavor is much stronger than the teas fragrance. And, just as happily, there is no bitterness or grassy flavor whatsoever in the tea...always a good sign. That said, in comparison to some other loose-leaf jasmine green teas I've tried, the flavor of this tea was still a bit weak. The flavor soon fades from the tongue, leaving little-after taste. And once again, the fragrance of the tea is surprisingly weak even when brewed. Wondering if I somehow screwed up the brewing of the first cup of tea I tried (I let it brew for 3 minutes), I decided to risk some bitterness and used the remaining leaves from the sample for a second cup, allowing the tea to brew for four minutes instead. I did notice a slight upward adjustment in the strength of the flavor happily, although it was not significant. But in terms of flavor and fragrance the tea still didn't quite compare to, say, Mighty Leaf's Jasmine Green Tea or Dragonwaters Jasmine Special Green Tea. Thus, I found this tea to not exactly meet my "snobbish" standards in the world of Jasmine Teas, as I found the fragrance of the tea to be especially weak, whether brewed or not. And the flavor, while very good and moderately strong, still was a "wee bit lacking" in comparison to other jasmine green teas I've had. However, I suspect I'm kind of weird, in that I love "flowery teas" with strong flavors and fragrances. And while this tea doesn't compare to some of my favorite jasmine teas, it is still very good. For many people who prefer a less "potent" jasmine tea in terms of flavor and fragrance, this green tea from Choice Organics might just meet your needs perfectly. Recommendation : Yes. While I found this tea to be not as strong in terms of flavor or fragrance in comparison to other jasmine teas I've tried, I still enjoyed this tea. And if you prefer less "potent", some might say "toxic," jasmine teas, then this tea from Choice Organic Teas is for you. The tea for this review was provided by Choice Organic Teas. Available from : Amazon.Com, Choice Organic Tea Website and some organic retail stores. Brewing Instructions : Use 1 teaspoon of leaves per cup. Pour 1 cup near boiling water over tea leaves. Let brew 3-4 minutes. 3 minutes was used for this review.